Back of tile: "The leader talking god keeps alert for all his dancers in the Navajo Yei-Bei-Chia dance ceremony which is also know as the "Nine-Day Night Chant." They usually dance all night on the final night." 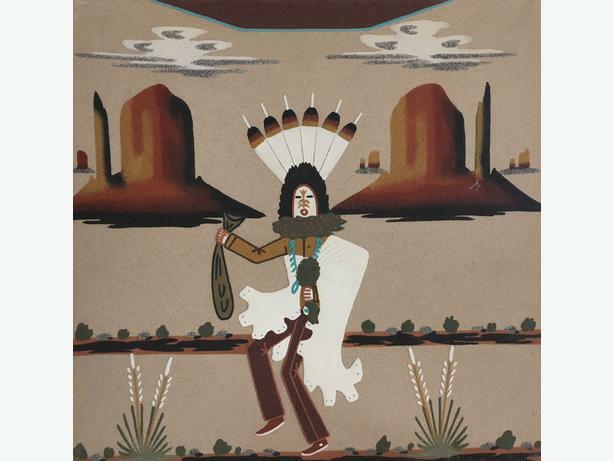 Created by Navajo Artist Wallace Watchman (1955 - 1999). Quality is perfect with no loss/damage to paint or surface. Beautiful piece.